“April is the cruelest month” says poet TS Eliot, but thankfully, this doesn’t apply to our garden in sunny Malibu. By the end of this month, I’ll have all the summer crops planted and we’ll be safely above 55 degrees even at night, and probably above 60. I’m adding an inch of compost to every bed as a layer of mulch, and then mulching with chicken bedding on top of that for added poop-power! The combination of compost with a top layer of bedding encourages our friends the earthworms to come and get the compost, bringing it down to the roots under the warmth and moisture-barrier of the chicken bedding straw. So we really will be able to plant our summer crops a week or two earlier than our climate would otherwise allow, in five new beds that our carpenter Cirino has built with his team. Meaning yummy things will be on the table earlier, with less chance of attack by pests, from stronger plants with better immunity and more complex flavors, and also in greater quantities! By summer crops, I mean the most heat-loving herbs and fruiting vegetables: cucumbers, tomatoes, basil, tomatillos, bell peppers, chilli peppers, zucchini and all the summer squash (including flying saucer style patty pans), all the winter squash too (because despite their name, they love the heat! ), melons and watermelons, and of course, a wide variety of heirloom pumpkins to festoon the paths with their curly tendrils and then, in autumn, to give us deliciousness for pumpkin soup! I’ve also sown seeds for some heat-loving greens in readiness for dinner in August. We’ll have a new bed of New Zealand spinach, half a bed of mache (also known as corn salad), and a variety that’s new to this garden, called Malabar spinach. All three will happily feed us fresh greens when the lettuces are bolting. Always be prepared! 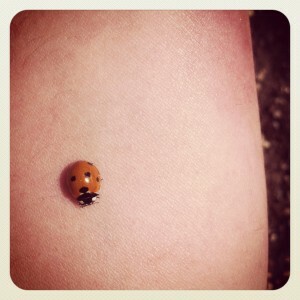 There’s good news from the brassica beds, thank goodness, with the aphids completely vanished due to our campaign of relentless smooshing and the healthy appetites of our ladybug friends (like the pretty one in the picture). 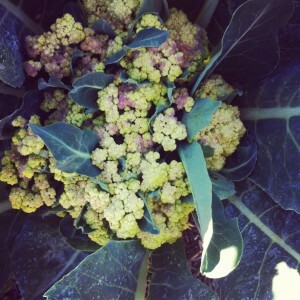 The only things noteworthy happening in the brassica beds now are sweet and luscious fronds of Romanesco broccoli, a slightly schizophrenic vegetable because it’s sometimes called Romanecso cauliflower, and sometimes called Romanesco broccoli. It’s easy to see it’s more usually called a cauliflower, because it’s usually harvested when it forms a tight cauliflower-style head. 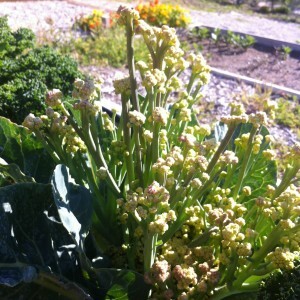 But leave it a little longer, and it forms broccoli-style spears that are sweeter and more interesting in flavor. It’s more usual to see it billed and harvested as Romanesco broccoli in Italy, where it originates. All the woody herb beds are now coming into their stride, including thyme, tarragon, oregano, sage and marjoram, and our tiny tender herb seedlings are emerging in the parsley, chervil, dill and cilantro patches. Spring artichokes are going bananas, as are the citrus. We still have crazy amounts of lemons! Also salad greens, carrots (enormous, multi-colored and according to a few guests, the sweetest and most delicious carrots ever!). Sue was excited to eat her first apple of the year, and also the very first blueberry from this year’s crop, which is very early and was delightfully plump! I see passionfruit too, and the beginnings of figs. And our avocado trees are all looking glossy and healthy again, thanks to their deep hand watering schedule. I do love hand watering. I also love watering plants with compost tea, made simply by adding unspeakable poop-type things to a metal barrel and leaving it to steep in the sun for a week. It makes a wonderfully rich ‘tea’ that I apply with a watering can, but also, it’s great when misted onto the leaves. Leaves absorb probably as much nutrition as roots, kind of like us absorbing stuff through our skin. We love moisturizers applied to our skin, and they love compost tea applied to their leaves. And so I do! Sue, Marc and I sowed some luffa seeds together a few weeks ago, it was lovely. We all planted them along with our wishes and intentions, and it felt very special. I think they’re going to be particularly magical shower luffas when they’re ready! And it’s exciting to see the cute Lima, Malibu and red noodle bean seedlings emerging from the soil where I buried them a few weeks ago. 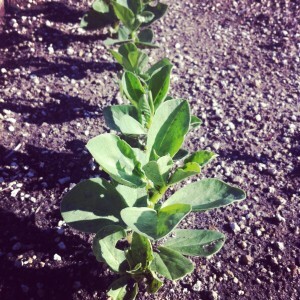 So tiny now, but like Jack’s beanstalk, they are destined to reach for the sky!